Manila is sending a mission to Washington later this month to begin preliminary talks on the US-Philippines free-trade agreement (FTA) that was discussed by President Duterte and his American counterpart Donald J. Trump in their bilateral meeting early this week. In an interview with reporters at the sidelines of the recently concluded 31st Asean Summit and Related Summits, Trade Undersecretary Ceferino S. Rodolfo said he will be going to Washington to discuss the US-Philippines Trade and Investment Framework Agreement (Tifa). “We’re going to start preliminary discussions at the end of the month. The visit is to have a bilateral strategic dialogue with them, and a mini-Tifa discussion; so that’s when we’ll start the discussions,” Rodolfo shared. The Office of the United States Trade Representative (USTR) has issued a statement welcoming the Philippines’s interest in a bilateral FTA. Rodolfo said they are taking that opportunity to discuss it further as soon as possible. Garments and textiles will be the main areas of offensive interest for Manila in the proposed FTA, as 75 percent of Philippine products are already entering the US duty free. Aside from garments and textiles, carrageenan, wrist watches and most agricultural products, among others, do not enjoy preferential treatment in the US. Washington, on the other hand, is interested in infrastructure, public utilities and also agriculture. Rodolfo said he will be discussing with his counterpart issues on the FTA talks, including the timeline and scoping sessions. He noted that an inception study undertaken by the Philippine Institute for Development Studies has indicated positive results for a prospective US-Philippines FTA. Market access will be the main benefit of the FTA, as well as the establishment of an investment framework for the US. “Talks are preliminary; but, the good thing is, they’re now open for an FTA,” he added. Rodolfo said they can hopefully conclude the FTA in three years. During their bilateral meeting on Tuesday, Duterte, taking cue from complaints aired by Trump that Japanese-made vehicles are being assessed tariff rates considerably lower than American automobiles in the country, pressed for the forging of an FTA between the Philippines and the US. “President Trump singled out the issue on tariffs being imposed on US automobiles, while these tariffs were not being imposed on Japanese cars,” Presidential Spokesman Harry L. Roque Jr. told reporters in sharing the highlights of the Trump-Duterte meeting that lasted for over 40 minutes on the sidelines of the 31st Associations of Southeast Asian Nations Summit and Related Meetings in Manila. 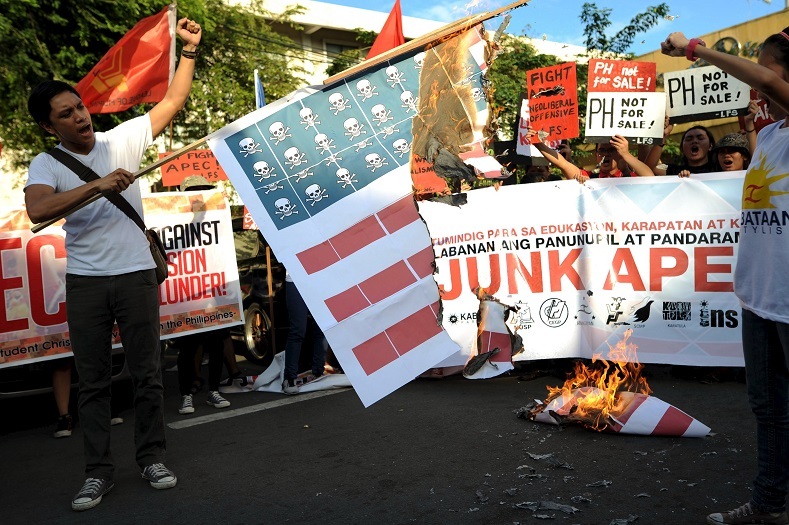 But the Philippine side also took a swipe at Washington for opting to conclude a FTA with Vietnam and Japan ahead of the Philippines, a longtime US ally. “The Philippines expressed a view that they’re appreciative of the general system of preference, and suggested that free-trade agreements must also be concluded between the US and the Philippines because their FTA is concluded by America with Vietnam and Japan, who have not always been the allies of the US. President Trump said they will study the matter,” Roque said. Trump’s concerns over the preferential treatment being accorded by Manila to vehicles coming from Japan have already been highlighted by the USTR. Currently, the tariff rate imposed on Japanese automobiles is around 20 percent for vehicles with 3-liter engines and zero for those with bigger engines. Data from the USTR show American cars are slapped with higher tariffs. The USTR said the Philippines applies a 30-percent tariff on passenger cars; 20 percent to 30 percent on vehicles for the transport of goods; and 15 percent to 20 percent on vehicles for the transport of persons, depending on vehicle weight. “Asean countries and Japan enjoy preferential import tariffs on new vehicle imports under the Asean free-trade agreement and the Japan-Philippines Economic Partnership Agreement, respectively,” the USTR stated in a document. Aside from the issue on automobile tariffs, Roque said Trump and Duterte also touched on the gaping disparity in trade numbers between the US and the Philippines, with Manila having the advantage. Trump also ranted over the imbalance in US trade with other countries—including with Japan and China—in his other official visits. This is consistent with his “Make America Great Again” campaign. “They will probably think of a way to reduce the trade surplus between the Philippines and the United States. Well, the deficit because the Philippines, according to the US, has a trade deficit with China, and they will work out something to reduce the deficit of trade between the Philippines and China and, at the same time, improving trade relations with the United States,” Roque said. Data from the Philippine Statistics Authority showed that in the January-to-September period, exports to the US reached $7.04 billion, a 5.2-percent growth from $6.69 billion in the same period in 2016. Imports from the US, meanwhile, amounted to only $5.15 billion in the January-to-September period, a 7.3-percent decline from $5.55 billion in 2016. On March 11, 2002, US Sen. Richard Lugar presented Senate Bill 2004, which authorized the American president to negotiate and conclude an FTA with the Philippines.